We are just days away from the worldwide release of Star Wars: Battlefront II, scheduled for 17th November. However, EA has given notice that eager gamers can right now, via Origin Access or EA Access, log in and do battle in the Star Wars Battlefront Play First Trial. 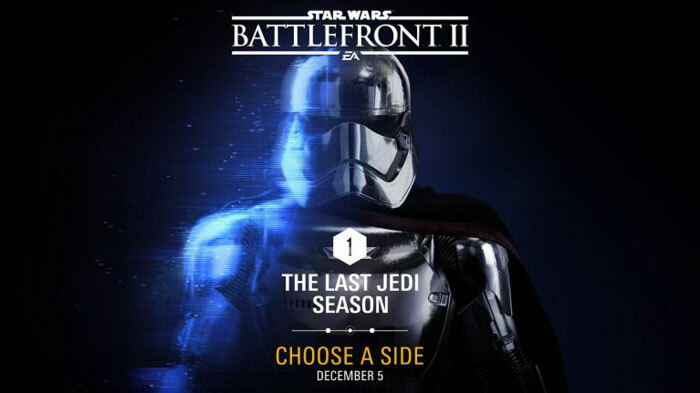 The trial allows you to “enjoy gut-wrenching starfighter battles above five planets, lead spectacular ground assaults on eleven gorgeous worlds, and join Inferno Squad for the first section of the new single player campaign.” Another way to get early access is to pick up the Deluxe Edition and start unlimited play from 14th November, suggests EA. Beyond the above the main purpose of today’s news bulletin is to tell of the first chunk of DLC on the way. EA says that free content is coming to SWBII gamers in the form of The Last Jedi. You are given notice that this DLC will deliver new heroes, maps, vehicles, and more - in December - and I’ll mention again that it’s free. On 5th Dec you will pick a side – the First Order or the Resistance. This makes a big difference to upcoming challenges and rewards. On 13th Dec stormtrooper-turned-hero Finn joins the fight for the Resistance and Captain Phasma steps on to the Battlefront for the First Order. These heroes will be purchasable with credits during this week. There is also a crate of high-power upgrades provided as spoils for the winning faction. 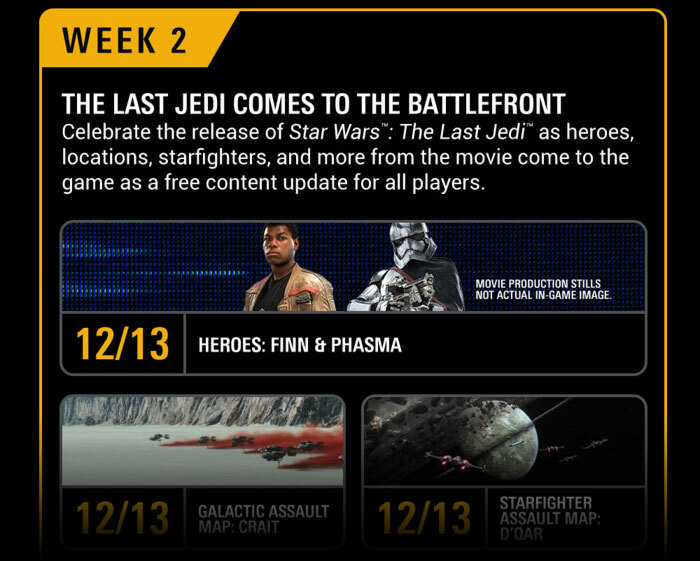 As you can see above, 13th Dec is a significant date and that is when new locations and vehicles will also arrive, Iden Versio returns in a new single-player story called ‘Resurrection’, new daily challenges begin, and the week culminates with ‘Galactic Assault Sunday’. Incidentally around this time (on 15th Dec) The Last Jedi is released to movie theatres. In the following fortnight EA has shared further plans for daily and weekly challenges to keep you enthralled and busy. On the topic of the movies, Disney has just announced a new Star Wars trilogy. The Last Jedi director, Rian Johnson, will ‘shepherd’ the new trilogy, said Disney CEO Bob Iger at the recent 2017 earnings briefing. The films will be separate from the Skywalker saga, we are told, with new characters from a corner of the galaxy previously untouched by the Star Wars story.